Over the years, Timisoara, the largest city in western Romania, has been influenced by many culutres. The charm of this city, settled on the northern bank of the river Bega, lies in its distinct architectural character and vibrant cultural life. Frequently referred to as " Little Vienna," Timisoara is home to year-round musical and theatrical performances, art galleries, museum and a buzzing nightlife. A progressive, cosmopolitan place, Timisoara was the first city in Europe and second in the world after New York, to use electricity to illuminate it`s public streets. Timisoara has lots of public squares and lush green retrats. The city is easy to explore on foot. If you get tired, a tram will be along in a moment. I spend one Sunday in Timisoara and I like this city. What do you think? 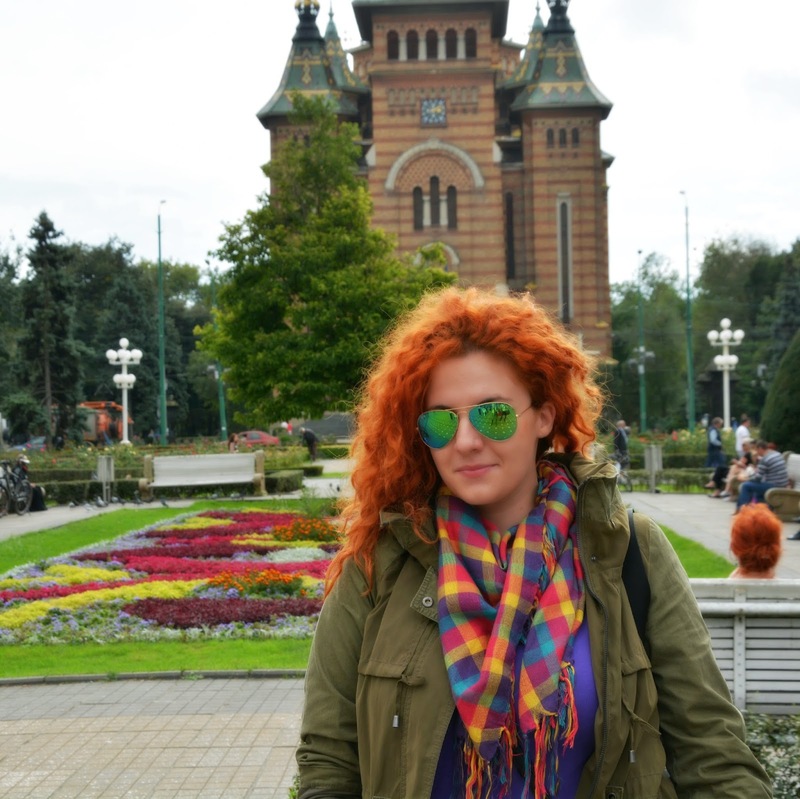 Have you ever been to Timisoara? I love your colourful look!!!! Amazing place! love your scarf! beautiful flowers! and i love your scarf! Wonderful pics and I love your colorful look!!! Lovely photos, this place is very beautiful! Obozavam tvoje postove sa putovanja. Fantasticno. A ti izgledas odlicno. Patikice su divne. hello from Romania! beautiful post! you look pretty! amazing pics and I love your shoes! I love the fierce and colorful scarf and sneakers! So damn cool! Kakav smeo odnos boja, prelepo..uz tvoju boju kose posebno interesantno! I fotke su ti prelepe!! Ovo je fenomenalno i slike i outfit, a ti se predivna! It's one of the most beautiful cities in my country! Awesome photos ! u look amazing babe! and so many amazing flowers! Thanks for your nice words, happy rest of the week! Divne fotografije!Sve je veseloi puno boja, Bas ti dobro stoji! Nice to see you in Romania, wonderful photos, hope you had a great time!